Kids are back in school, and the car pool season is upon us. During your drives to school, sports, music lessons and all the other places your children have got to be, of course, you must remember to have everyone in the car buckle up and have children in booster seats where appropriate. But did you know there. s another hazard? Local attorney Michael S. Morgenstern is trying to get the word out: Keep Passenger Seat Backs UP! while the car is in motion to avoid death or serious injury during a collision. Many people are unaware that the seat belt may not restrain properly when the passenger is reclined. When the seat is reclined, a child or adult can "submarine" under the seatbelt because the shoulder belt lifts off the shoulder and no longer restrains the occupant. The passenger can shoot into the car's floorboard which could result in catastrophic injuries or death. Morgenstern just won a nearly $60 million verdict for a client in this situation. 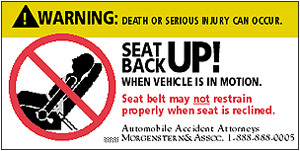 Now Morgenstern has created a warning sticker alerting drivers and passengers to this potential danger. 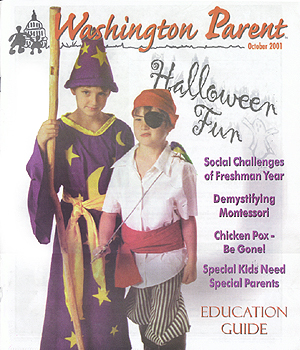 For your stickers and more information, visit www.michaelmorgenstern.com or call 888-888-0005.